add some zing to your wings with some sliced red chilli! Marinade the wings in the fish sauce and ground cumin. Leave in the fridge for at least 1 hour. Get a thick, large saucepan or wok (to prevent the oil form spitting over the side). Pour in your oil, making sure never to fill more than halfway up your pan. Bring it to heat over a medium-high flame. Use a wooden implement (such as chopsticks) to test the temperature of the oil. Place your implement into the oil; if it fizzes, then your oil is around 180C and you are ready to go! 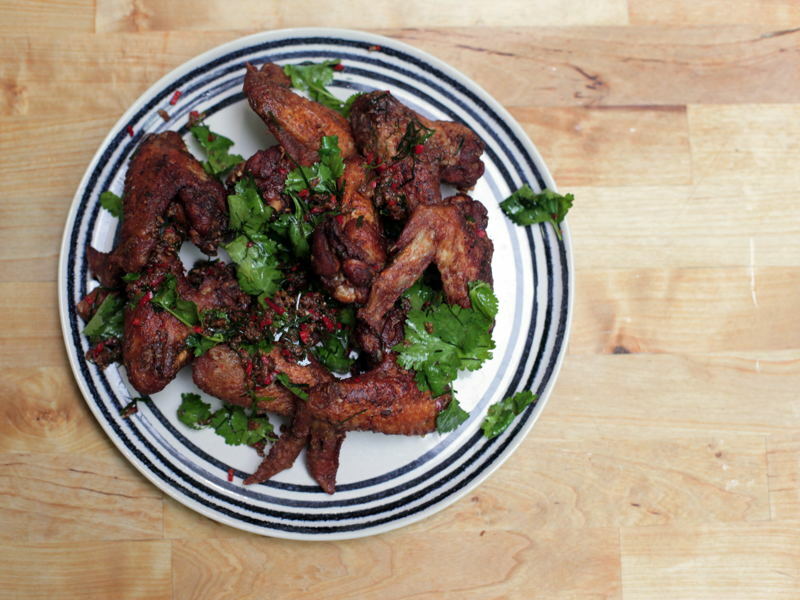 In batches, fry the wings until cooked through and a gorgeous golden brown colour. Drain wings through on kitchen paper, but leave the oil in your pan for the garnish. Place your fried shallots into a pestle and mortar, then crush. Add the palm sugar and sea salt before crushing them all together. Put the sliced lime leaf and sliced red chilli together in a sieve. Quickly dip this into the hot oil left in your wok (to release flavour). Add the lime leaf and chilli to the shallots, palm sugar and sea salt and then mix thoroughly. Add fresh coriander to complete your garnish; mix the complete garnish into your chicken wings in a large bowl. Finally, serve the wings on a plate.